Most of you know, my day job is a Cheese Monger and a local grocery store, ok my official tital is Cheese Master, but I don’t like to throw that around. (I worked 23 years to earn the title of master, I’m keeping it!) So throughout the day, I am recommending different cheese to people, from Cheese plate to recipes. I was motivated to make a macaroni and cheese, with some of our great cheeses. Murray’s Brand Boerenkass Gouda-(Boar-en-Kaux) Boer means 'farmer' and kaas means 'cheese', in Dutch. The curds are made from raw milk and then rinsed of the acidic, watery whey before getting pressed into large, flat spherical wheels. This special treatment cuts out sharpness and allows butterscotch and cashew flavors to prevail over an 18-24 month aging period. 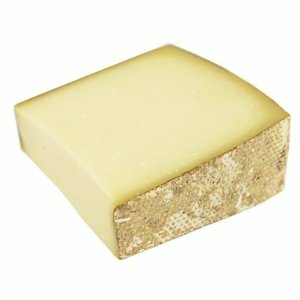 Cave Aged Gruyere-(Gree-Air) Gruyère is sweet but slightly salty, with a flavor that varies widely with age. It is often described as creamy and nutty when young, becoming with age more assertive, earthy and complex. When fully aged (five months to a year) it tends to have small cracks which impart a slightly grainy texture. Craig’s not a fan of elbow noodles, so I used Penne, but use what you like! Now let me tell you….I don’t think I could have made a better Mac & Cheese if I tried! 1 cup pasta water, as needed. While your preparing the pasta, melt the butter, and add the pepper and nutmeg. Whisk in the flour, cooking it until it is no longer pasty tasting. Add in ½-3/4 of the chicken broth, and whisk until the broth is smooth and thick. Add in the cream to increase the creaminess of the sauce. If the sauce is too think, add more broth. Slowly add in the cheese, stirring constantly to ensure it is melted thoroughly. Drain pasta, reserving some of the water, in case you need to thin out the cheese sauce. Mix together with pasta, and sprinkle with shredded cheese. At this point, you could bake the mac and cheese, but I didn’t, to preserve the moisture. While I was recently on vacation I was checking out Pinterest, and came across several great recipes, one in particular was Tandoori Chicken. Now Craig and I have discovered Indian & Persian food a few years back, and we both SO love the flavors, so I knew this would be an easy sell….But I had no idea how easy! In addition to this I came across a recipe for Indian Rice. So of late I haven’t been blogging, because, well the recipes I’ve been trying, just haven’t been trying. I’ve been following them, taking pictures…and alas…reviews are, “don’t make this again!”. So figuring that this, might or might not work, I decided to not take pictures. Well that was a mistake. When dinner was served, there was a resounding “Can you put this on the regular rotation”? 3 Cut deep slashes in 3-4 places on the chicken pieces. Just make 2-3 cuts if you are using separate drumsticks and thighs. Coat the chicken in the marinade, cover and chill for at least an hour (preferably 6 hours), no more than 8 hours. 5 Turn the chicken so it is brown (even a little bit charred) on all sides, then move it to the cool side of the grill. Cover and cook for at least 20 minutes, up to 40 minutes (or longer) depending on the size of the chicken and the temperature of the grill. The chicken is done when its juices run clear, and it 160°-180°F. 1 Place rice in a sieve and run cool water through it to rinse it until the water runs clear. Soak the rice in cool water for 30 minutes. Drain. 2 Using a spice basket (large tea ball), place the cloves, cardamom and cinnamon into the basket. Bring 8 cups of water and the salt to a boil in a large pot, add the spice ball and simmer for 10 minutes. Add the rice and stir. Taste the rice, and test if it is done to your taste; rice can take more or less time to cook depending on how old it is. If still too firm, cook a few minutes longer. 3 When the rice is cooked to your liking, drain the rice into a colander and rinse with cold water to stop if from cooking. Remove the spice ball and discard the contents. Set the rice aside to drain. 4 In a pan large enough to hold the rice, heat the oil over medium-high heat. Add the mustard and cumin seeds and the chile flakes. Cook until the mustard seeds start popping, then add the onion. Sauté until the onion begins to brown, about 5-7 minutes. 5 Add the garlic and sauté another 2-3 minutes. Add the rice and mix well. Sprinkle the turmeric over the rice and mix well. Cook for another 3-4 minutes, stirring often. A week ago, a friend gave me a bag FULL of smoked salmon, and said he has a ton and will have more soon. Well, I love salmon, so who am I to refuse? First I used some of it for a Smoked Salmon Caesar Salad, and last night we had company for dinner, so I decided to make some Smoked Salmon Spread. In a food processor, soften the cream cheese, add the Worcestershire sauce, seasonings and capers, blend until smooth. Add Smoked salmon, and pulse to mix, but not enough to puree the salmon! As you can see from the picture our dog, Zoey joined us on our journey to Whidbey Island’s great Double Bluff Beach. It’s an “off leash” park, so she was really able to enjoy the sights, sounds and smells of the beach. Craig loves to search of seashells, so I was excited to find this little gem! After our walk to the end of the beach and back we decided to enjoy our picnic. For our lunch, I made a Turkey and Smoked Gouda sandwich on Ciabatta roll, with a “quick” pasta salad. Need something for lunch, or a last minute picnic? Here is what I make whenever I need to make an unplanned side dish. While the pasta is boiling, get the vegetables ready. When the pasta is done, rinse in cold water. Then add all vegetables to pasta, and toss with salad dressing.